“Hudson Announces Nectaris DS”, that’s the headline I long to hear. Nectaris, released in North America as Military Madness, is fantastically popular in Japan, and it has a cult following overseas. Unlike most hex grid strategy games Nectaris focuses on strategy and tactics rather than unit stats and realism. Realism is, in fact, eschewed in favour of a fanciful plot, with tanks and planes fighting for dominance on the surface of Earth’s moon. 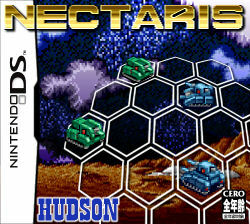 Nectaris is a game that cries out for a DS release. It could make especially good use of the DS’ dual screen architecture. I imagine being able to tap a unit on the bottom screen and seeing its details on the top, or scrolling around the zoomed-in map on the bottom and seeing the whole battlefield on top. And the wireless capabilities! Nectaris has always had a two-player option, but hinking about wireless or (dare I say it) internet multiplayer makes me weak in the knees. And then the extras. The virtually unlimited storage afforded by the DS carts could easily see all the maps from the PC Engine and Playstation versions as well as the extra units from the incredible Neo Nectaris bundled into one package. The DS is such an ideal platform for this game that it is nigh criminal for Hudson to not release this game. It’s easy on the resources and there’s a guaranteed audience of old fans, and the success of Advance Wars has created an awareness of the genre, with new fans looking to scratch an itch. Come on, Hudson, how about it? If not for them, do it for me.